Dell's new super slim Inspiron 11z netbook is the company's latest netbook, boasting an impressively slim form factor and notably improved battery life. The Dell Inspiron 11z is also Dell's first CULV system in Europe, weighs in at just 1.4kg and is a paltry 25.8mm thin. Dell's marketing message is that the new computer "combines the portability of a netbook with the capability of a laptop, and has all the ingredients to make it the ultimate stylish digital companion." Specs wise, in addition to Intel's ultra-low voltage CULV processor, the Inspiron 11z comes with up to 4GB memory, a "long battery life" (six hours claimed) and features a HD 1,366x768 resolution 11.6-inch screen – in addition to all the usual gubbins such as integrated Wi-Fi, 1.3 mega-pixel webcam, and hard drive space of up to 500GB. "Since its initial launch with the The Carphone Warehouse in the UK in August, demand for a device that combines the portability of a netbook with the technical capabilities of a full sized laptop is clear," said Phil Bryant, VP and General Manager, Dell EMEA Consumer. "Our Inspiron 11z is the perfect solution for users who cannot compromise on processing power but demand ultra-portability and style." 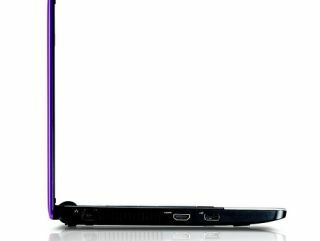 From £349 for the base model it seems like a decent package, if you're in the market for a stylish netbook – and Dell is also making them available in various colours including Obsidian Black, Alpine White, Flamingo Pink, New Cherry Red, Ice Blue, Jade Green, and Passion Purple.